Anton Beaudelaire during Mr. Richards. 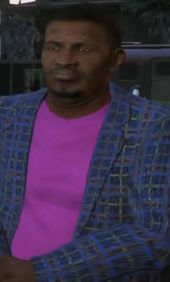 Anton Beaudelaire is a character in the HD Universe who appears as a minor character in Grand Theft Auto V. He is voiced by Oberon K.A. Adjepong. Anton Beaudelaire is an Vinewood based film director who had directed a number of heavily artistic independent films and developed a drug addiction, leading to direct the film Meltdown for Solomon Richards and Richards Majestic for the money. When Milton McIlroy, the films star, leaves the set, Anton also leaves although it is unknown if he also left with him or to bring him back. Michael De Santa is later sent by Solomon to bring McIlroy back to the set but also brings back Beaudelaire. Beaudelaire and McIlroy both finish the film, appearing at the films premiere. This page was last modified on 20 November 2013, at 23:10.